In my previous article in this series, on The Wave…of American Flavors, I gave a resoundingly positive review of The Wave’s menu while reassuring those with unadventurous palates (or fears of organic cuisine) to put their concerns aside, and just give The Wave a chance. In the hierarchy of adventurous, Sanaa has firmly entrenched itself above The Wave, and may actually be a bit too much for some Walt Disney World guests. I would strongly encourage readers to give it a try even if the menu doesn’t sound like it contains items they’d typically try, as the cuisine has consistently been among some of the best we’ve had in all of Walt Disney World. The real edge at Sanaa is the menu. As with a lot of menus, and I don’t mean this in a negative way as I understand the importance of quality marketing, I think a lot of the text is window-dressing. For example, if you enjoy more conservative meals, you may see the heading, “African Cooking with Indian Flavors” and dismiss-out-of-hand everything within that category. If you look a little deeper, you’ll see one of the items is a N.Y. Strip Steak. While its preparation with Chutney may not be the most conventional, a good steak is a good steak, and from what I’ve heard, this is an excellent steak. We’ve been to Sanaa at both lunch and dinner, and have yet to have a single menu item that was anything less than excellent. “Bland” is a word that is most definitely not in Sanaa’s vocabulary, as every menu item titillates and captivates the palate. Sarah has tried a couple different varieties of the sustainable fish, which obviously changes daily. It has always been flavorful and prepared with the the perfect dressing accompaniment. I would never have expected an African restaurant to do fish so well, but my real world experience with African restaurants is admittedly quite limited (for some odd reason, there aren’t exactly oodles of them in Indianapolis). Sanaa also does African wines and beers, albeit with a very limited selection on the beers, fairly well, and you’d be remiss if you ordered a domestic beverage. Desserts at Sanaa are also not to be missed, as they also feature Sanaa’s unique, but excellent, flavors and presentation. 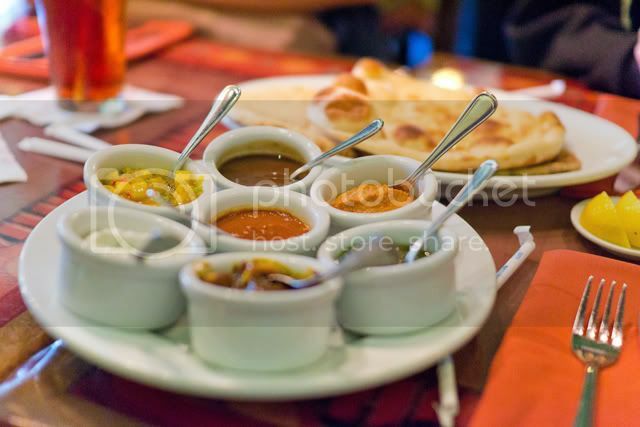 Last time we visited, our server brought out a complimentary Indian Bread Service. Bread is something I would not typically order as an appetizer because most restaurants provide reasonably decent bread complimentary, but this bread has me re-thinking that position. The bread was amazing, unlike anything I’ve had at Walt Disney World (move over, Le Cellier pretzel bread! ), and the sauces, particularly the Cucumber Raita were addicting. 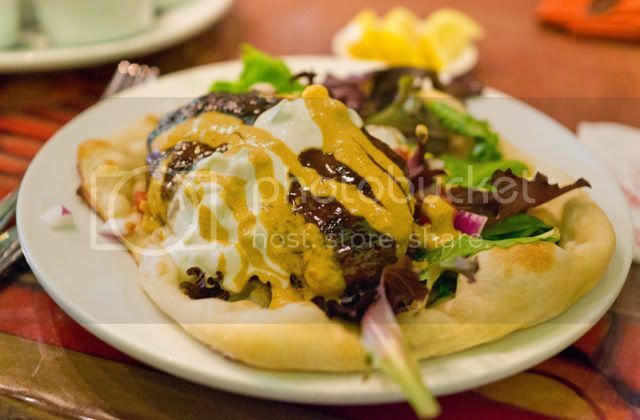 My favorite dish is presently the lunch menu’s Grilled Lamb Kefta. Between the deliciously grilled lamb and the out-of-this world Cucumber-Yogurt Raita, my taste buds were singing (seriously, I actually think I heard their faint acapella version of “Now is the Time”). It’s only 9 am as I write this, yet I just drooled on my keyboard reminiscing about that delicious dish. At only $12.49, this Kefta was only slightly more expensive than a Quick Service meal, and it was decidedly more delicious and unique! The next time we go to Sanaa, which I assure you will be very soon, I’m seriously considering blindly just pointing to a menu item when it comes time to order. Our success there with delicious cuisine has been unprecedented, and I’m beginning to think I might like just about anything on the menu if I give it a chance. If you think you might be interested in experimenting with a different type of cuisine, and don’t want to break the bank on something you may not like, without reservations, I recommend taking a break from Animal Kingdom at lunch some day–or going after you finish all of Disney’s Animal Kingdom by lunch!–for Sanaa. Speaking of reservations, thanks to a combination of its menu and location, Sanaa almost never is crowded. 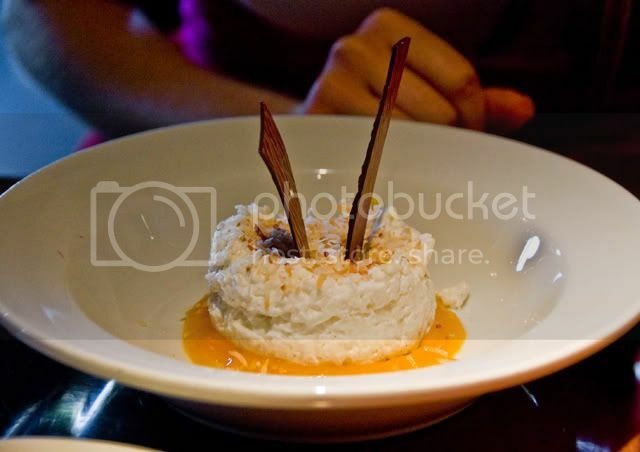 This can be great when you want a great place to eat at the last minute, want to avoid the typical crowds of restaurants, or just want to enjoy the delightful ambiance of a window table without the wait that typically entails at more popular locations like Coral Reef and California Grill. As you have probably gathered by my gushing over the restaurant, it’s one of my favorite places to eat at Walt Disney World, and probably the most unheralded gem of them all. It represents the pinnacle of menu creativity, flavor, and yet somehow is still a good value! While it may not be for everyone, if you look at the menu and even think there are a couple items that might appeal to you even a little bit, I highly encourage you to give it a try. Have you tried Sanaa? Think I’m right on the money or “insanaane” with my glowing review? If you haven’t tried it, do you have any plans on making the trek out to Kidani Village to give it a shot? Let us know your thoughts in the comments! So…the other day we were driving down the road and my 5 year old son says, “whoa, I just saw a cow giving another cow a piggy-back ride.” I read your funny story about the zebras and it reminded me of my own child. Anyway, we are going to Sanaa for the first time and can’t wait to try it! Thanks for your reviews!! So many jokes are running through my head, but this is a Disney blog, so I’ll just bite me tongue. 🙂 Your story is very funny, though! Thank you for the lovely review, Tom. My Mother and I enjoyed lunch at Sanaa in Sept of 2009. We had a different concern. We are Indian and were worried that the food would be something we could easily make ourselves or find at a restaurant near us. The manager’s husband was Indian also and she sat down and talked with us at length about the menu. She insisted that we try the bread service on the house to see how we felt about it. It was truly unique and delicious. While the sauces shared names with things I make frequently, the flavors were unique. When my Mom told the manager how much she loved the Dum Biriyani, the chef came out and spoke to us about the ingredients he used and how the dish was prepared. It was the best meal we had at WDW because the food was delicious and unique and the service was unparalleled. This is really awesome to hear. I’m glad it’s not just enjoyable as a supposedly authentic experience for a slack-jawed Midwesterner like myself. It speaks volumes about Sanaa that you, with more experience concerning the cuisine, would also be impressed! Can’t wait until our September trip. Planning on going here with the DH. He loves spicy food and has been to Africa, so we shall see what his take on it is. I just love the looks of the desserts and drinks. Anxiously anticipating a wonderful meal. I can’t wait to try this place, unfortunately “African Cooking with Indian Flavors” will scare the bejeezus out of my wife, so I might be going solo. Let your DW know that there are several items that are not intense to choose from. This is from someone who does not put any pepper on her food. DH & I had lunch at Sanaa on our last trip. We both LOVED it! I do not enjoy spicy food but the server helped me find multiple items to choose from. They were flavorful while not being too much for me. We ordered the bread sampler and she told me which sauces may be to intense for me. the whole meal was wonderful. We have ADR’s for our next trip in September where it will be 5 adults and 2 kids. This is a well timed post for me. I have an ADR for Sanaa in October, but was considering dropping it after hearing a ho hum review on a podcast. You’ve convinced to to keep it! I loved Sanaa, and so did my adventurous 4 year old! It was one of the few places we could get a last-minute ADR, but we probably didn’t need it. We did wait just a bit, which was not a problem since my daughter could have played the drums near the hostess stand all night. The food was fantastic and very reasonably priced. I would highly recommend it anyone….and don’t bother with the kids menu. My daughter ate the bread service and shared our appetizers and was very happy! Thanks for a great review. 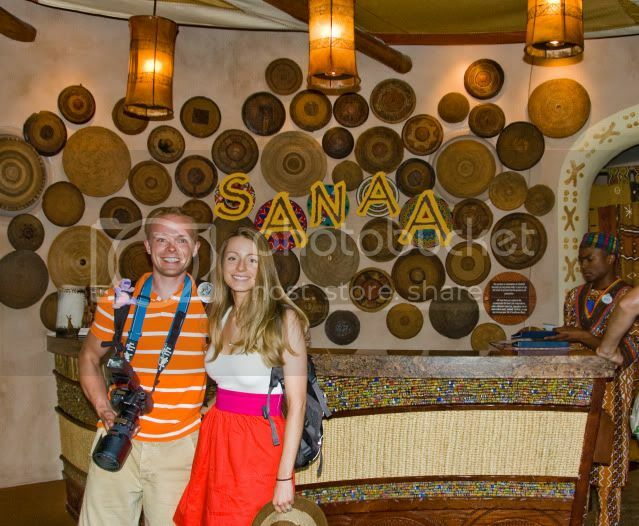 We stayed at Animal Kingdom Lodge recently and friends highly recommended that we try Sanaa. We did not, but after reading your review, I am regretting it. I will put it on my list for our next trip. My question is..what options do they offer for non-adventurous children? (ie not spicy, not saucy dishes) Would love for them to try a new type of cuisine, but am thinking realistically that they won’t enjoy it, and that will be money down the drain, and 2 hungry kids. 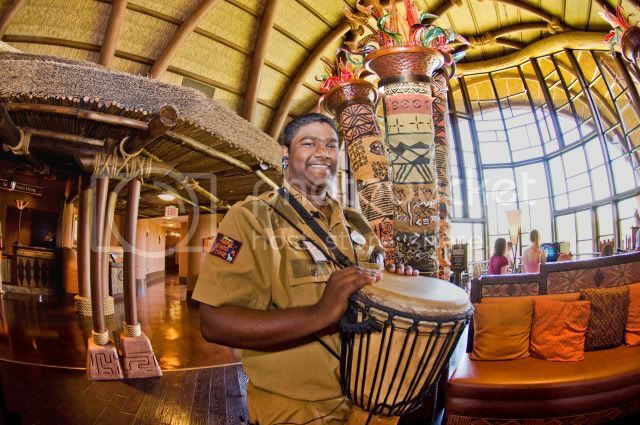 I love this type of cuisine, but I find Animal Kingdom Lodge such a trek to get to if you don’t have a car. Definitely going to make the effort next time though! Speaking of podcasts, heard you on WDW this week Tom. Great job! Although its strange to associate a voice with someone you’ve seen pictures of, but never heard speak. And I just realized that totally sounded stalker-ish. We’ll be at AKL later this month. You’re review is very tempting. Might check to see if we can get a table without an ADR — we’re already over planned and I refuse to add another ADR! I’ve been balking over going to Sanaa during our family trip in December. At least one person in our group doesn’t have an adventurous palate. After reading this, I’m going to have to revisit the idea of going. It sounds like it might not be as aversive as we originally thought. Hi Tom! I went with five others to Sanaa this past May and it was incredible! I tried the Safari beer from the bar prior to being seated and loved it. We didn’t try the bread service, but nearly all of us had the two meat + rice combination. The servings looked small from the pictures I had seen online, but the food was more than enough. I loved the spiciness of the Durban chicken and the sauce leftover from the main dishes blended wonderfully with the long grain rice. We were all on the dining plan so everyone tried a different dessert. I chose one of the samplers and while most of them were decent, the Chai Cream is out of this world (easily the best dessert I tried the entire vacation). I would highly recommend this place to anyone considering Disney table service dining. We have been to Sanaa twice and loved it both times. The first time we were on the dining plan and loved the entree and desserts. The second time, my mom and I shared the flat bread starter. It filled us both, so we were unable to add dessert (sigh). I had an African Reissling and mom had hot tea. The wine was wonderful and the tea was as high quality as the coffee shop I go to in Nashville. We were both really impressed with the restaurant and will happily visit again. Ate there in Jan. with our family and it was wonderful. Great food that was very different from the usual fare. The Bread service was fantastic! Friendly service. Beautiful animals roaming right by the windows… what more could you ask! (except a free Zebra floor show?) LOL!